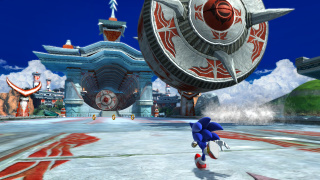 Seaside Hill is the sixth stage in Sonic Generations for the PC, PS3, and Xbox 360; revisiting the original Seaside Hill of Sonic Heroes. 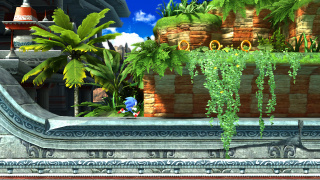 Part tropical island, part ancient ruins courtesy of another Heroes Level, Ocean Palace, this zone serves as the game's main underwater level. Modern Sonic speeds through this zone along looping alabaster highways and aquaplaning over the water as in Adabat, and may choose to either jump along the backs of giant turtles or drive a go-kart on a suspended road. Classic Sonic, meanwhile, takes to the submarine underground in temple sections reminiscent of Hydrocity Zone and Labyrinth Zone and has to run away from giant spiked rolling stones towards the end. As both Sonics can be underwater for good portions of the level, air bubbles are also back in this zone. This issue can be remedied for Classic Sonic if the player has the Aqua Shield equipped. Both Acts see Sonic moving rapidly to avoid pursuit; giant spiked wheels on land, and the fatal Mega Chopper at sea. Seaside Hill is part of the Dreamcast-era trio of levels opened up after the defeat of the Death Egg Robot, coming after Speed Highway and City Escape. Seaside Hill being part of Sonic Heroes was never on the Dreamcast. However, level layouts and gameplay in the original game were similar to previous Sonic Adventure and Sonic Adventure 2. Of Sonic's friends hoovered up by the Time Eater, it's Espio the Chameleon who ends up frozen outside here. Chopper — Leap out from under log bridges as in the original. However, now they spend some of their time in the background, so can't always be hit. Mega Chopper — The giant fish from Green Hill, patrolling the shoreline and eating any hedgehogs who stray too far. Egg Pawn — Orange robots wielding a variety of different weapons, from lances to energy guns. Spinner — Helicopter-bats which serve as homing attack stepping-stones. Electro Spinner — A repainted spina with electrical defences; don't attack them too rashly! This page was last edited on 27 April 2018, at 15:43.